Oceanside Unified School District's $195 million school bond passed easily in June with 71 percent of voters approving the measure. At a time when office vacancy rates are rising in nearly every San Diego County submarket, the I-15 Corridor is drawing major national and regional tenants to the Class A marketplace. Earlier this month, Poseidon Resources overcame one of its biggest hurdles in its plan to build the largest desalination facility in the Western Hemisphere in Carlsbad: getting approval from the California Coastal Commission. As the curtain falls on the 2008 summer theater season, Vista's Moonlight Amphitheatre will initiate facility upgrades and construction of its highly anticipated and much-needed new stage house. The city of Carlsbad and NRG Energy Inc. are butting heads over the site of a new power plant to replace the 50-year-old Encina Power Station that could provide power to more than 160,000 homes in San Diego County. San Elijo Hills Development Co. has started construction on the 32,000-square-foot first phase of the San Elijo Hills Town Center mixed-use complex. Should your firm consider design-build? Recently the Engineering & General Contractors Association and the Construction Management Association of America and American Public Works Association sponsored a design-build workshop to help local engineering contractors examine whether design-build might be a good business model for them. Attendees learned of the many opportunities for design-build public projects in the San Diego region. For more than half a century, San Diego County has imported water to meet the needs of its population. Its economic vitality and quality of life continue to be dependent on this foundation of imported water. Yet its heavy reliance on this imported supply has been compromised by a sustained seven-year drought in the Colorado River Basin and an ever- increasing demand on that same water supply from Arizona and Nevada for their growing needs. When Vista voters passed Proposition L, a 30-year half-cent sales tax increase in November of 2006 to finance several community projects, residents identified a new sports park as a necessity. City leaders concurred. Parents of high school students in San Diego's North County now have educational options if their children are interested in construction-related careers. North County Trade Tech High School is officially opening its doors in Vista in September, and any student entering ninth grade this fall is eligible to apply. Just two years after devastating fires swept through San Diego County in 2004, Vista residents narrowly approved Proposition L, a 30-year, half-cent sales tax increase to finance $100 million in community projects, including two new fire stations. The population in east North County is growing, and so is its need for more educational facilities. As San Diego County has grown, so has its need for treated water. As consumers increasingly turn to the Internet for their shopping needs, mall owners are under ever more pressure to attract business. 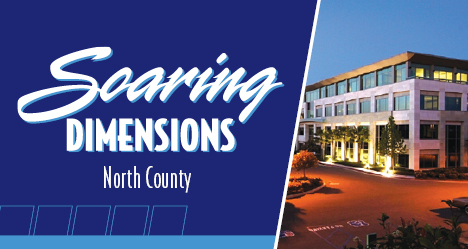 Factor in the lost tax revenues that help fund city budgets, and it's understandable that city officials in Escondido and Carlsbad are eagerly awaiting major renovations at Westfield LLC's North County and Plaza Camino Real shopping centers. The city of Vista broke ground on its long-awaited civic center, the second of several projects financed by Proposition L revenues, on Aug. 26. California Transportation Department officials said plans are moving forward on the long-anticipated project to widen and straighten almost 6 miles of state Route 76 between Oceanside and Fallbrook. While they may not steal the green building spotlight as much as the LEED Platinum-rated Ranch House at Black Mountain Ranch did last year, many of North County's current construction projects are incorporating green practices, too. A rail line finally opens, an Oceanside resort edges closer to reality and a North County university lures other development. A North County population that is growing in size and age has prompted the creation and upgrade of several medical facilities in the area. The design phase has begun for an 80,000-square-foot outpatient clinic for the U.S. Department of Veterans Affairs at Seagate Corporate Center, north of Oceanside Boulevard in Oceanside. RJC Architects, a San Diego architecture and planning company, won a design/build competition for a $24 million parking structure at California State University at San Marcos (CSUSM). Reno Contracting has just broken ground on a new health care facility that is set to gear a local pharmaceutical company into a new future. Construction is nearing completion of the two-building ECR Corporate Center at 6250 and 6260 El Camino Real in Carlsbad. The center will accommodate the Tri-City Wellness Center and a medical office building. The project is slated for completion in November. Ground has been broken on the Quail Garden Corporate Center, which, upon completion, is expected to be the first private LEED-certified building in Encinitas. Wal-Mart formally submitted its plans this week to expand its store on Community Road in Poway to become the county's first supercenter. As energy costs continue to rise, San Diego area businesses are “going green” from floor to ceiling -- or make that roof. Ledcor Construction Inc. has construction under way for Windy Point Corporate Center, the future home to the sports medicine school of Saint Augustine University at 750 Windy Way in San Marcos. McCarthy Building Companies Inc. has been selected by the Carlsbad Unified School District (CUSD) as the contractor for the $86 million renovation of Carlsbad High School at 3557 Lancer Way in Carlsbad. As a civil engineer in San Diego for more than three decades, Patrick O'Day has weathered his fair share of recessions.